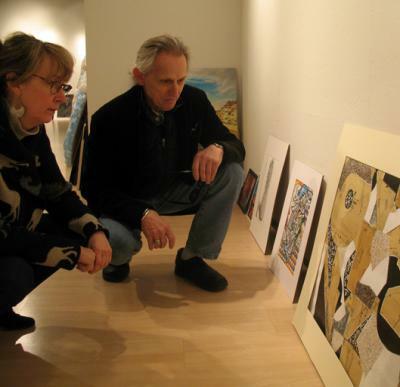 The season of juried exhibitions is upon us, and I have been telling first-timers—more than usual—that jurors are strange critters, and there is no telling what they will do, so all the artist can do is take his or her best shot, understanding that with the volume of entries, the odds of rejection runs high. As it happens, Mercyhurst University is hosting a juried exhibition of student work, and the afore-said "critters" brought in to ferret through the entries to come up with the best possible show are two respected local artists, Patty Baldwhin and Brian Pardini, who kindly met me on the first day of the show to walk through it and talk about their jury process. The jurors indicated that when they arrived, instead of having to go through piles or seeing the work presented one by one, the work was neatly spaced out around the gallery. Giving the first of two important kudos to gallery director Heather Dana, they stated that each work had its own space for consideration, while allowing the work of the highest standards to stand out. Brian and Patty began by walking around the gallery, considering everything, and then on their second trip around, they eliminated everything that did not come up to the standard presented by the stronger works. Then, they went through to finalize the look of the show and give out the four awards to what they deemed most meritorious. Obviously the work was going to be drawn from classroom assignments. In some cases, "the facility was so good as to merit inclusion." By this they mean, if I understand them correctly, that some things were, for example, obvious classroom work, which however had superior technical skill and dedication, that it had to be respected. In other cases, the artist went so far beyond the assignment that the work could stand on its own in any gallery. The process is a completely subjective one, influenced by many things. Consider for example the two drawings that Brian felt a particular affinity which I thought had deficits that out weighed the positive qualities. Conclusion: this artist was fortunate to have had Brian as juror rather than me. However, quality does show, and the pieces the jurors gave awards would have also been found on my short list of award considerations as well. One of these awards, the Gary Cardot Award for Photography, went to Rodolfo Caros for "Restaurant Door." In a show that is generally strong on photography, no doubt due at least in part to the expert eye and tutelage of Gary Cardot, this image stands out. It is a simple, yet strong image of a glass door with the hint of a car and street beyond, cut-out light patterns above and the back of a chair in the foreground. Patty found it "Whimsical," Brian "Spooky," while I enjoyed the rich darks and the contrast of light and the subtleties presented in this work. A word about framing here. This is a student show and art students are usually broke and lucky to be able to get something into a matt, much less framed. I get that, and the jurors did not hold it against them. However, the photographers consistently had their work exhibition ready—again, a credit to Gary Cardot. Though a warning here for those who did not use a matt; it isn't good for a work to be directly up against glass. Patty gave Heather Dana another interesting kudos. Pointing to Hilda Navarro's "Kuna Indian from Panama," and J. John Thiede's "Figure Study with Tattoo," which I believe to be one of the strongest works in the show, Patty observed: "Heather has consistently created 'thought spaces' around these works. See in the Navarro: on its own, it is certainly good enough to be published in National Geographic, and in a different, context, the Thiede would be taken as a fine figure study. But placed together as they are, I am drawn to the fact that there are intricate patterns made in the Kuna textiles and intricate patterning on the skin of the figure study and my mind is given a 'thought space' to see how these two seemingly un-related things go together. It's a gift!" Patty also pointed out a couple of artists whose work is of such variety and quality that, "I want to see more of their work." One of these is Jillian Barrile, who made a rather traditional, if slightly surreal, black and white photo on one hand and an explosion of color on the other. Another specifically mentioned was Durim Loshaj, whose work included a traditional classroom still life, a felt pen composition seemingly with tattoo and graffiti influences, and one of the standout paintings, which won an honorable mention. The only things these works have in common are precision in design and attention to detail. For those students who didn't get into this show, there is no shame in the attempt if you submitted your best. You have taken a step into the big leagues, where your work is likely to be declined more often than not, and rejection, though disheartening, is a valuable experience and part of the process. There is no law that says that every viewer—much less a juror—must love every work they see. Remember, the process is a subjective one, and jurors are strange and exotic critters in the best of times and monsters in the worst. For those who did make it into this show, and especially if it is your first juried show, congratulations and well done. This will help your portfolio, and to that end, I, and the Erie Reader, are pleased to give you your first professional review. We expect great things in the future from all of you. This exhibition continues through March 18 at the Cummings Gallery, Mercyhurst University, 501 E. 38th St. Hours Tuesday through Sunday 2 to 5pm, Thursday 7 to 9 pm.